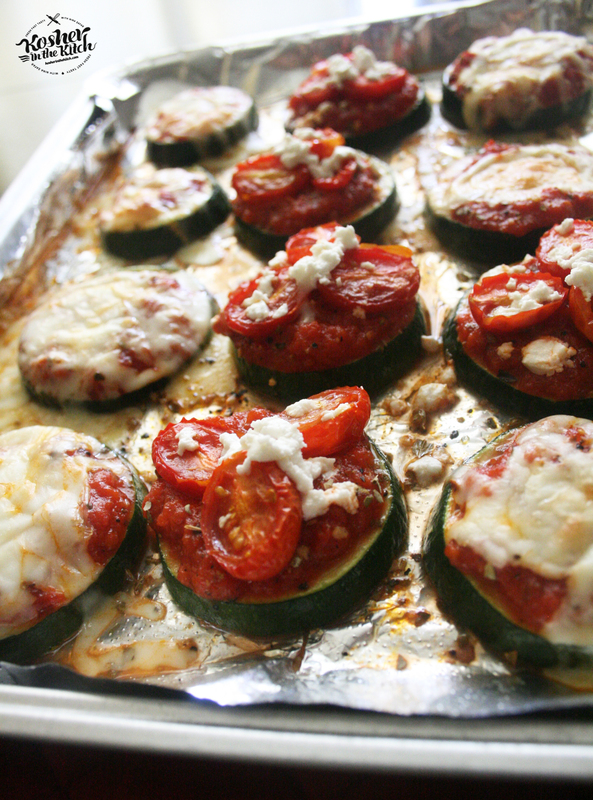 Zucchini Pizza Bites - Kosher In The Kitch! 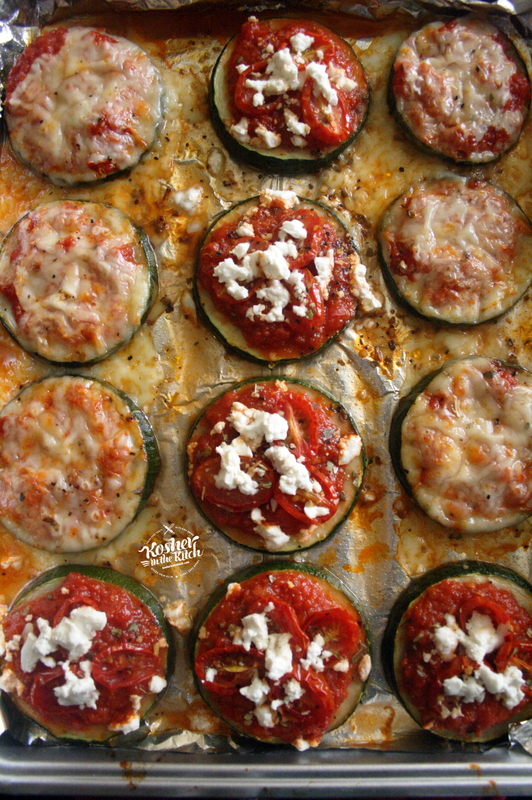 Zucchini Pizza Bites - Kosher In The Kitch! 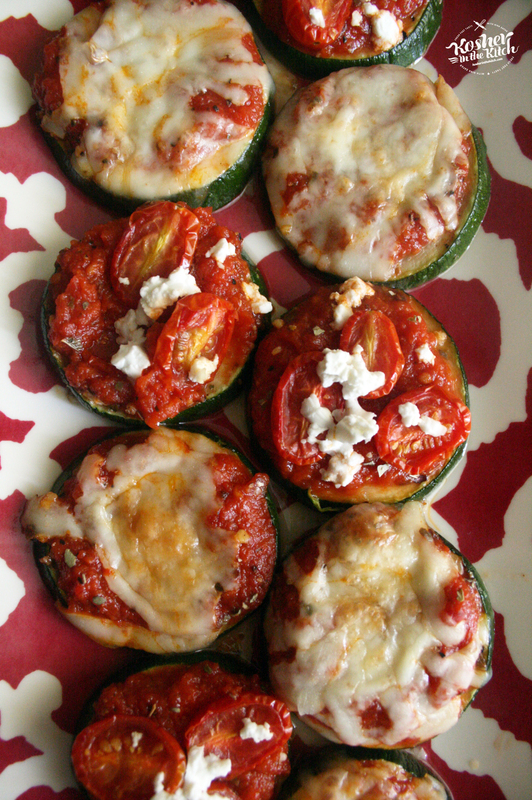 If you like pizza, but not the heavy feeling that usually comes with eating carbs, you will LOVE this dish! It’s a quick and delicious way to indulge in everyones favorite meal without the guilt or calories. Wash the zucchini and dry clean. Slice 1/4 inch thick rounds. Brush both sides with olive oil or spray with PAM Olive Oil. Place on a baking tray and broil for about 10 minutes. Then add about a tablespoon of pizza sauce to each round, sprinkle some cheese on top and bake for an additional 10 minutes until slightly crispy and browned. * For additional toppings, place pizza sauce, then roasted cherry tomatoes and crumble feta on top then bake for an additional 10 minutes until slightly crispy and browned. To roast the cherry tomatoes: Slice the cherry tomatoes in half lengthwise, place on baking tray then drizzle some olive oil and honey on top. Season with salt and pepper. Place in oven 400′ and cook for 20 – 25 minutes until slightly browned.